This is the first post in the Mythology and the Psyche series, based on Joseph Campbell’s lecture ‘Psyche and Symbol’ in Mythos. You can find a list of all the posts in the series here. A quick note: while the term the Self is used partially as a reference to Jung’s concept, I do not use the capital S in any sense of ‘reverence’, only to distinguish it from the conscious sense of identity, or ‘self.’ The Self here is capitalized only to signal that it incorporates the entire psyche including the aspects of ourselves we have no awareness of or actively resist identifying with. 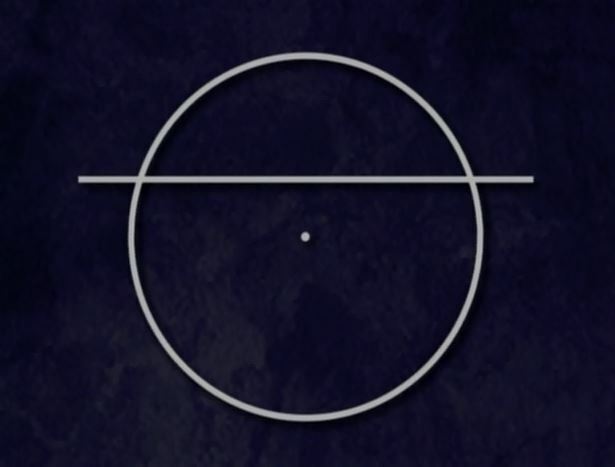 The circle is you: your psyche. 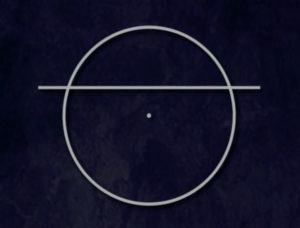 The horizontal line represents the threshold between your conscious mind, above the line, and your unconscious mind, below. The centre of the circle is the seat of the Self. The Self here is not an equivalent of the term ‘atman,’ which Campbell explains is often translated as ‘the self,’ as atman refers to “undifferentiated consciousness.” This is the transcendent realm from which the visible world emanates and is supported, and is beyond the duality of our physical reality. Rather, the Self referred to here is the “consciousness enclosed in a specific human body, namely yours.” While mythology, and the hero’s journey, does focus on this ‘transcendental self’ extensively, mythology also acknowledges that we are each – at least temporarily – trapped inside a physical body and psyche. You have a physical life, with physical realities, with which you’ve got to deal. At its core, mythology is a guide to navigating the inevitable struggles of everyday life, not simple the grand machinations of an impersonal universe. The Self Campbell identifies in this model is not just the conscious awareness of yourself. All you refer to when you say “I” – the ego, your sense experience, memories, your personality, your opinions and preferences – are all only infinitely small aspects which arise from the Self. Jung uses the term Self to refer to the totality of the psyche including your conscious mind and the limitless unconscious mind. Here is the trick: the Self is *both* the centre of the circle, and the circle itself. For the Self embraces everything you are and *could be* – all of your untapped, hidden gifts, as well as every potential toward the darker side of human nature, be it selfishness, greed, violence, or worse. The Self, then, can be nearly impossible to fully realize and accept, because its full expression represents the conscious unification of all of these aspects, the fully realized Self embraces everything. This is the heart of the hero’s journey, the quest to encounter and come to peace with all that you are – for it is all that the world is, too. It’s with this in mind that we look at the Self in this model. As it is the centre point and the circle, so too is the Self the origin and the ambition of the hero’s journey. The Self inspires the desire to reach one’s full potential, to attain a feeling of wholeness, and to cease the internal contradictions and conflicts we so often bury with neuroses, judgements, addictions, and obsessions. The hero figures of the journey are, essentially, going through this process of Self-realization to find the peace of their own wholeness and to bring this peace back to the world. Of course, the journey ultimately reaches passed the Self toward the undifferentiated consciousness of the eternal, and so, in a sense, the journey fulfils the Self in order to transcend it, but for now we will focus on the individual Self-realization process. Now, as Campbell points out again and again: the journey is not required. The call to adventure can always be refused. In fact, as we saw in the cosmogonic cycle, over the course of the universe’s life, the journey’s completion is inevitable: you need do nothing. Likewise, as Jung points out, just as the body grows unconsciously, so too does the Self effortlessly unfold with age: “Insofar as this process [of individuation], as a rule, runs its course unconsciously as it has from time immemorial, it means no more than that the acorn becomes an oak, the calf a cow, and the child an adult.” However, the process – the journey – taken on purposefully, is something quite different: “made conscious, consciousness must confront the unconscious and a balance between the opposites must be found.” Confronting the unconscious, and accepting whatever you find there is terrifying. But this is the hero’s journey: it is radical self-acceptance, and by extension, the radical acceptance of life. Campbell puts it this way: “If you say ‘no’ to one little detail of your life, you’ve unravelled the whole thing. You have to say ‘yes’ to the whole thing, including its extinction. That’s what’s known as ‘joyful participation in the sorrows of the world.’” Thus, Campbell suggests that the great question mythology asks of us is: “Do I dare?” Do you have the courage to say ‘Yes!’ to your adventure? To the darkest places in yourself? To the sorrow of life? Because that’s what the journey is. The tales are themselves a guide and an invitation, the heroes are symbols of the Self, fully realized, awakening the desire to take up the journey ourselves. But what stands in the way, the source of much of the terror the journey inspires, is the ego. While the Self is your true centre, and itself opens up to the eternal realm, it still retains a sense of identity which is separate from everyone else. From this intuitive individuality arises the ego. The ego is the corner of the psyche with which we are the most familiar. Residing above the threshold of consciousness, the ego acts as our second “centre.” It is the centre of our waking consciousness, the seat of our identity, and our sense of being. The “running commentary” of thoughts all but the zen monks among us experience all day every day, all of our opinions and preferences, our passing judgements, these all also arise from the ego. The ego is a kind of gatekeeper, a selector, which decides what the most important and relevant elements of the environment or situation are, and brings them into our immediate awareness. We need the ego to run this interference with the outside world, otherwise we would be too overwhelmed to function. The ego streamlines the world, transforming it into something manageable: impressions that it can collect, organize, catalogue, and interpret. From here, decisions are approachable, even clear. The ego thus has a significant role in making life liveable, but it also, paradoxically, makes life intolerable. For Jung, the ego is little more than the command centre of our minds: the lens through which we relate to the outside world. In mythology, the concept of the ego is far more expansive. In the cosmogonic cycle, Campbell explains that the transcendent, eternal realm exists before the visible world arises. There are no opposites, no divisions, no distinctions: it is simply whole. In fact, for Campbell, the ego perspective is precisely what creates the visible world. For the visible world is made up of duality: light/dark; male/female; up/down etc. The known universe is only known because it is separate from the eternal. The transcendent realm cannot be perceived from the human perspective because with no distinctions whatsoever, there is nothing to see (rather more like Nothing). The ego, by its very nature a selector, a judge, thus has no direct access to the transcendent; too rigid an ego, in mythology, is precisely what separates us from the eternal. In Jung’s circular models of the psyche, the ego is the centre point and the Self is the circle. For Jung, we thus have two centres. In Campbell’s model, the ego is not our centre. It is, experientially, the centre of our awareness, but in The Power of Myth Campbell explains that from the point of view that the ego eclipses the transcendent, it is “that aspect of our consciousness that we identify as our centre. But it’s very off-centre. 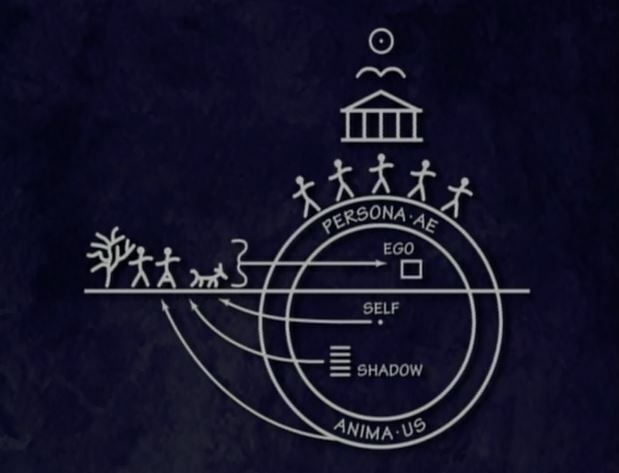 We think this is what is running the show, but it isn’t.” The ego’s perspective is likewise off and in the model it’s a rectangle to suggest “that its mode of judgement is not in accord with the body, with that of nature.” Campbell uses the example of a typical, rectangular room: “it’s built by consciousness. When you walk out of this room you come into the country out there … it has nothing to do with rectangles. And, all conscious thinking is likewise out of accord with the order of the body.” The ego is enslaved by logic, mental boxes and sharp corners which make navigating the world more simple, but it also separates us from fuller knowledge of the Self. The ego likes facts because it loves, above all else, to be right. But only the ego is smug with data, where genuine insight pierces the inflated ego and resonates, expanding our awareness. The ego memorizes facts, calculates, and understands. Wisdom wakes the Self who knows. The ego is blinded by its own self-importance. Convinced it is our centre and “is running the show,” it mistakenly believes it’s in full control of our thoughts, decisions, and behaviour. Our true centre, the Self, is seated below the threshold of consciousness, and these unknown aspects of the Self often usurp the ego’s perceived control on our lives, reactions, and choices. The truth is we do not know ourselves. The ego believes it has Self-knowledge, when all it really has – before the process of Self-realization – is familiarity with the personality (itself curated by the ego): what you would or would not do, what you do or don’t believe, what you tend to like and dislike, and so on. The ego splits everything into ‘good’ or ‘bad’, the Self embraces everything. The Self, in the limitless unconscious realm, is virtually unknown to the ego. The unconscious is unconscious, after all. To some extent this Self-ignorance is innocent, the ego just doesn’t know, and much of what resides beneath the ego’s threshold is there only because the ego decided it’s irrelevant – for example, the constant noise of the electronics and air conditioning in your house which you are only aware of when the power suddenly goes out. But there is also a great deal which has been purposefully blocked from consciousness, aspects of the Self the ego resists and rejects, thus the more the Self emerges, the more the ego feels threatened (but more on this in the next post). And so mistaking the personality for the Self is also a game the ego plays: a trick to obscure the realization that the ego is just an unfathomable fraction of a limitless Self. It is the ego which refuses the call to adventure, because to undertake the journey is to undertake the ego’s death. The ego’s purpose is little more than to make life manageable, but taking itself too seriously, it sets out to make life bearable, which too often translates to trying to make life less painful. The trouble is, as the Buddha counselled, “All life is suffering.” In organizing the world, the ego imposes a matrix of reason onto our experiences, this makes decisions and navigating the world easier, but it can also create torment when an experience resists the ego’s model of how life should be. So an astronomical amount of the ego’s time and energy goes into scheming to avoid, minimize, or otherwise inoculate you against pain. The rest of the time it spends trying to make sense of it. Naturally, as you go through life, your ego learns from your experiences, your emotions, and the reactions of those around you, what causes pain and what enhances relief. Through this maze the ego constructs the personality and the “comfort zone” of behaviour and a certain level of control and stability in your environment. It’s a delicate balancing act to find what the ego judges to be the easiest, most gentle way through day-to-day life. Even most of the aspirations we have for our lives are molded by the ego’s phobia of pain. The common pursuit, for example, of losing weight with an eye toward improved health, is often also motivated by the belief that being “attractive” will guarantee greater happiness, minimize rejection, and generally make life less of a struggle. The problem is, the ego’s schemes always fail: either outright, or, more dangerously, the plan succeeds only to the discover that pain remains. This is something mythology does not deny. In fact, mythology continually emphasizes the agony of life: it’s unavoidable. It is the crux of the hero’s journey. We cling fiercely to our egos because we believe we are equal to them, and because we believe they protect us. And the thought of releasing the ego (or, at least, the idea that it’s in control) is unbearable, for the radical acceptance of life is the acceptance of suffering. For while the cosmogonic cycle reassures us that the eventual dissolution of the ego perspective is inevitable, it comes to us in the form of the many stories of the end of the world. It takes the world’s extinction to express the overwhelming fear of releasing the ego. The disintegration of the ego is often far more frightening than physical death: death is the detachment of consciousness from the body, the dissolution of the ego is the annihilation of our existence, consciousness itself. And so, as Campbell suggests, the central riddle of all mythology is surely: ‘Can the ego put itself to death?’ For this is the true journey the hero undertakes. The hero gradually sheds his ego, as a snake sheds an outworn skin. At the close of the journey, where the hero departs from the realm of ordinary life, this time for good, either in death or some other symbolic departure, we find the dissolution of the world in microcosm: the individual dissolves back into the transcendent. But what about you? The hero’s journey is a guide toward the full realization of the Self, but you’re the one who has to go through it. Ultimately, the message of the terrifying stories of Armageddon is the promise of our imminent divinity, but the real question is whether you are willing to let go of the ego and risk facing the world, and worst of all yourself, without the ego’s defences. This is so difficult because the ego’s grand seduction is the continual promise of peace, but never its fulfilment. The serenity of the ego is simply the counterfeit ease of a comfort zone. The hero’s journey, though blood-soaked and horrifying, reassures us that the road through the ego is the only way to genuine peace. Its price simply amounts to a personal apocalypse. For the reaches of the unconscious into which the journey descends holds the internal atom-bomb which, if even only glimpsed, would shatter the ego: the hero’s greatest fear is that he will not die before the journey’s end. But this is what full Self-realization truly requires: radical self-acceptance that may well destroy your identity and your very world. For the ego also constructs an external image which interacts with others, and establishes our status within our particular society. This is the realm of the ego’s dance partner: the persona. It is the ego’s mask, the mirage of the Self, and the next element in the model of the psyche. This is incredibly well written. Thank you! Why thank you 🙂 Hope it helped you! Thank you for this excellent article. May I use the pictures for a presentation? I will cite your site. Hi Armin, the pictures are actually from Mythos Part 1, a DVD of a lecture Joseph Campbell gave. So no need to cite me 🙂 Glad you enjoyed the article!